More black bears have been sighted in Fairfax County officials say. 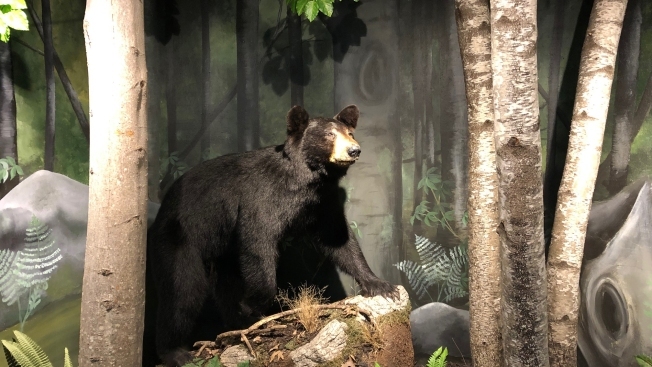 Two small black bears were seen Wednesday morning crossing Oakton Road in Oakton, Virginia, and a bear and cub were spotted Thursday morning on the 2700 block of Bowling Green Drive in Vienna, Virginia, Fairfax County officials said. The bears in Vienna nabbed a bird-feeder and took a bag of birdseed before they fled along I-66. These two sightings add to a sighting Sunday of a bear and cub. Bears typically avoid humans unless they’re on the hunt for food. They are attracted to bird feeders, garbage, outdoor pet food, compost piles, fruit trees and berry-producing shrubs. Bear encounters can be resolved almost immediately by removing the food source, officials said. They may come back searching for food, but they will stop returning after a few failed attempts. •	Keep a respectful distance from the bear. It will move on quickly in most instances. •	Give the bear space and do not approach it if it is up a tree or near your property. Bring your pets inside to give the bear a clear path to leave. •	Do not try to remove or “save” a small cub from an area. •	Remove food sources to discourage the bear from returning. •	Do not store trash or anything that smells like food in cars or on porches or decks. •	Make sure to keep your trash containers secured in a garage, shed or basement. •	Take your trash out in the morning if you use a trash collection service, not the night before. •	If you have a bird-feeder and a bear visits, take down your bird-feeder for 3 to 4 weeks. •	Encourage your neighbors to take similar precautions to minimize bears. •	Note that Animal Control Officers do not take actions to attempt to remove bears from a neighborhood unless the animal is sick or injured, or poses a threat to public safety. If you do see a bear, report it to the Virginia Department of Game and Inland Fisheries through the Virginia Wildlife Conflict Helpline at 855-571-9003.